Southern Cheyenne warrior Howling Wolf created the ledger drawings--accountants' ledgers were frequently used by Plains warrior-artists as sources of paper--now in Oberlin's collection between 1874 and 1875. His work and that of his contemporaries contributes not only to our understanding of the past and the Plains warriors' role in history, but they also reveal the creativity of the people who made them and the aesthetic decisions that prompted them. 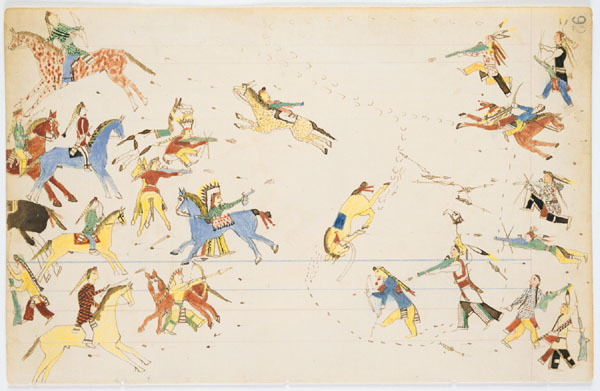 The Oberlin Ledger is a preeminent example of ledger drawings by a singularly important figure in Plains art. The drawing reproduced here illustrates how Howling Wolf expanded traditional forms by employing a panoramic view and multiple postures. Other drawings in the Oberlin Ledger reveal still other adaptations, such as concern for specificity of place and experiments with texture and color. "These drawings belie anthropological views of individual artists as unimportant, or nonexistent, components of a traditional Plains whole," writes University of New Mexico art historian Joyce M. Szabo in the Allen Memorial Art Museum Bulletin, Volume XLVI, Number 1, 1992. Howling Wolf created them, "as any self-conscious artist would--with determined attention to subject and composition, clarity of message, and constant investigation of new representational possibilities."